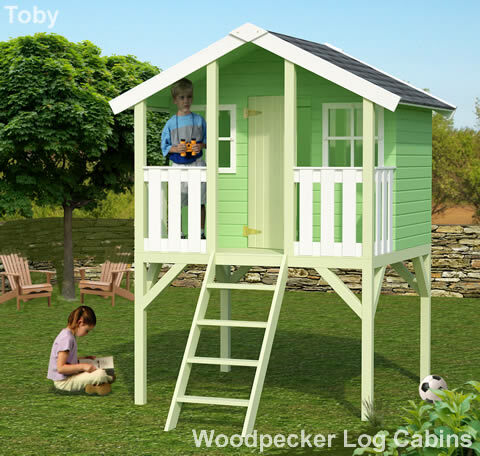 The Toby timber playhouse with its stilted legs and entrance ladder offers the feel of treehouse without the hassle of climbing a tree to build one, and without damaging your garden trees. Being raised off the ground makes for a wonderful den feel and it makes an excellent lookout post or watchtower in garden games. The wood comes unfinished, giving you flexibility to add your own creative touches whether it is a pink palace in the sky for your daughter or a camouflaged lookout tower for the lads, the Toby playhouse is excellent for either role. 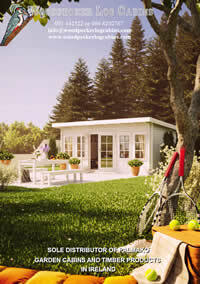 The Toby timber playhouse includes strong wooden rails, and a sturdy step ladder for safety. The roof and floor boards are a robust 16mm thick to keep out any bad weather, and the strong plexiglass windows help to keep the playhouse warm and dry. The 16mm timber walls come ready-made, for easy construction.They are strong, durable and weather-resistant, making the Toby playhouse an excellent balance of quality and cost.